Carl Andre’s investigations of sculpture as “place” have possibly resulted in the most drastic redefinition of three-dimensional art in the last 40 years. While best known for his sculptures made from metals, positioned flat on the floor and placed in symmetrical configurations, a rich and significant element of Carl Andre’s practice remains largely unseen and unpublished. 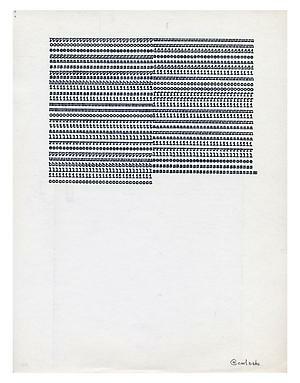 Throughout his life, language and poetry have been fundamental to the work of Carl Andre. From the beginning of his career, his poems have functioned as entries into catalogues about his work, appeared alongside his sculpture in exhibitions, formed exhibitions in their own right, been published in strictly limited editions, made appearances in scholarly writings about the artist, been repeatedly cited in relation to the development of avant-garde poetry. They have been referenced by a diverse multitude including poets, artists, theorists, musicians, linguists, psychologists, and cyberneticists. Impossible to dismiss, Andre’s experiments with word and text deserve collation and careful attention, not only because they cast significant light on his work in three-dimensions, but also because they supply a fascinating insight into his sensibility as an artist.